As the famous song goes, “The stars at night are big and bright, deep in the heart of Texas.” Venture out to any dark corner of the Lone Star State and you’ll see a sky full of shining stars, but there are places where the celestial wonders of the galaxy are showcased in all their awe-inspiring glory. Two of these stargazing spots are among the many state historic sites overseen by the Texas Historical Commission. Beyond providing a window to the universe, these sites have fascinating stories of their own to tell. Read on to discover both of them below and start planning your next stargazing adventure in Texas. More than 1,000 years ago, the Hasinai Caddo established a village and agricultural center just west of Nacogdoches that would thrive for centuries. In their heyday, they were the most developed prehistoric culture in Texas, and the Caddo word for friend, tejas, inspired the future name of the state. 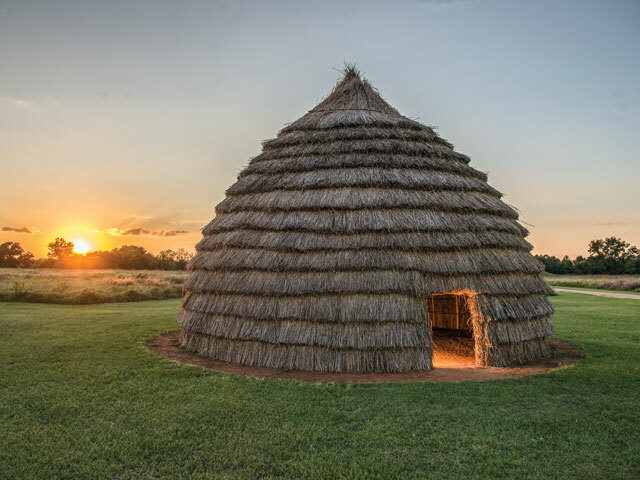 Check out the ancient earthen mounds, a replica of a grass-covered house and authentic artifacts. Don’t miss one of the special stargazing events led by local astronomers held throughout the year. Check the historic site’s Facebook page to see a full schedule of upcoming events. For nearly 15 years, Fort Griffin was part of a defensive line of forts that helped guard and protect the Lone Star State’s frontier. Located just 50 miles northeast of Abilene, the fort is surrounded by sprawling ranches and minimal light pollution, giving it some of the darkest skies in Texas. Planets, nebulas and other galaxies are visible on clear nights throughout the year. For the ultimate stargazing experience, make sure you’re at Fort Griffin for one of the monthly “Stars and Skies of Texas” stargazing events. Led by local astronomers, you’ll learn about the big and bright stars that light up the night sky, all while learning about and using telescopes and other astronomy equipment. Can’t make it for one of these events? Bring a telescope and camp overnight for a show unlike any other.